Installation of approximately 400 Phase I signs is complete. Installation of approximately 450 Phase II signs is anticipated to continue through 2018. 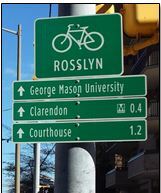 This system of directional or “wayfinding” signs is aimed to help people navigate the on-street bicycle network between Rosslyn and Ballston and to assist all users in finding their way around the County’s extensive trail networks. Arlington’s ‘white on green’ signs are modeled after national standards and include helpful information about orientation, destination, directions and distances. Major destinations and routes: Unlike typical north/south/east/west directions, directions in Arlington are usually established by major County destinations, such as Rosslyn, Ballston and East Falls Church. Similarly, major trail names are used when appropriate to help establish direction and to confirm location. 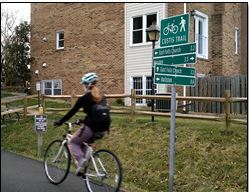 Neighborhoods and local destinations: Smaller signs, sorted by direction (straight, right or left) and by distance (near to far), act as “breadcrumbs” and are placed at important decision points. Strategic signage: To minimize sign clutter and maintenance costs, signs have been placed strategically and kept to a minimum to help people find their way. Future phases of the system may include the Columbia Pike corridor and other appropriate neighborhoods. Note: The Mount Vernon Trail along the Potomac River is part of the George Washington Memorial Parkway and is operated by the National Park Service.